Navy Rear Admiral George Read Muse was born in New Castle, Pennsylvania, on September 21, 1915 to Mr. & Mrs. George W. Muse. His father served in the Spanish American War and was district attorney for the county. Muse attended Arthur McGill and George Washington schools before graduating from New Castle High in January 1933. He also attended Bullis Preparatory Academy in Washington DC and graduated from the U. S. Naval Academy in 1938. While at the Academy, he played lacrosse, basketball and football. Commanding the destroyer USS STEPHEN POTTER (DD-538) during the sieges of Iwo Jima and Okinawa, Muse would receive the silver star for valor for his service in the Western Pacific during 1944-1945. In Korea he was assigned to the staff of the Commander of Naval Forces in the Far East three months before fighting broke out. He prepared papers for and attended peace negotiations, some of them behind enemy lines. During 1961-1962, Muse commanded the cruiser USS OKLAHOMA CITY (CLG-5). In 1962-1965, he was Director of Officer Distribution at the Bureau of Naval Personnel, assigning some 75,000 Naval officers to their various posts. 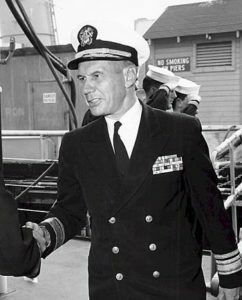 He received the Legion of Merit Award for his service as Chief of Staff and Aide to Commander Cruiser-Destroyer Force, U.S. Pacific Fleet from 1965-1966. Muse was promoted to Rear Admiral in January 1967. In May 1970, he was took over as Commander of the Naval Forces in the Philippines. Later he commanded the Naval Reserve Training Command in Omaha, Nebraska. He retired in June 1972 to North Carolina after service spanning nearly four decades and three wars. He married Mary Jane Metzler, daughter of Mr. & Mrs. Charles Metzler of New Castle. They had two daughters. Admiral Muse died October 30, 2001 at Pinehurst, North Carolina.